Sherlock Host Review 2019: Is Sherlock Host a Good Hosting? 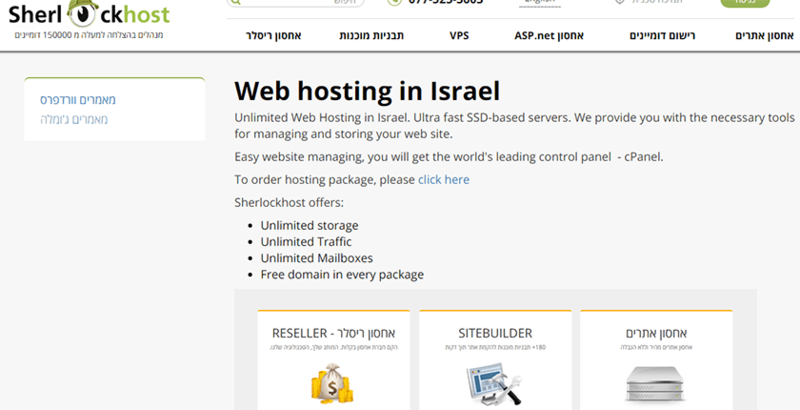 Founded in 2010, Sherlock Host has quickly become the go-to website hosting provider in Israel, Europe, and beyond. The Israeli company is best known for its uncompromisingly excellent customer support. Sherlock Host is a relatively new entrant into the web hosting space, but it is quickly carving a name for itself as the go-to web hosting provider for unlimited hosting, beautiful website templates, and excellent domain registration services. Founded in 2010, SherlockHost is a privately held company with headquarters in Herzliya, Hamerkaz in Israel. This Israeli website hosting vendor is available for individuals and small businesses in the United Kingdom, Ukraine, Russia, Spain, and the United States. The Sherlock Host website is available in a number of languages including English, Hebrew, and Russian. Intuitively simple registration process – this makes it the perfect website hosting vendor for people who are buying their very first website hosting services. Ultra-fast SSD-based servers – these super-fast servers are located in a number of countries including Germany, England, Netherlands, Ukraine, and Russia. Sherlock Host is the perfect blend of affordability and exceptional customer support. With no bandwidth limitations even in its cheapest package, it’s no surprise that many people have a lot of good things to say about Sherlock Host website hosting solutions. While Sherlock Host has no free version of its web hosting solutions, it offers all its customers a free 7-day trial upon signing. With its 99.99% uptime guarantee, Sherlock Host web hosting has the potential to save you money over time that you could have lost working with an unreliable and unsecure vendor. What’s more, Sherlock Host offers to move client websites to its servers at no cost and in the shortest time possible, sometimes in just one hour. Furthermore, the web hosting provider makes it quite easy to move from one hosting plan to another even when you are downgrading your subscription. SherlockHost VPS hosting packages are relatively cheap and include automatic installations, information protection from DDoS attacks and hackers, and an option to switch servers any time. Practically everyone who has used Sherlock Host’s website hosting services seems to be impressed by its support team. Given that it targets individuals and small businesses, most of whom have little technical know-how regarding hosting and website management, it makes perfect sense that many would be delighted to work with a company with an impeccable commitment to customer care. Sherlock Host’s 24/7 over-the-phone customer support as well as its fast ticketing process endears it to many. However, the live chat on its website is only available during working hours. While the emails we sent after office hours remained unanswered till the following morning, our phone calls were answered right away and the team was extremely courteous, patient and helpful. Sherlock Host is the preferred vendor for newbies and experts alike who want a straightforward solution to their website hosting needs. It has gained traction for its secure, superfast SSD servers, as well as its courteous, helpful, and skilled technical support team. Wondering how Sherlock Host stacks up against other Web Hosting companies? Enter any other Web Hosting company and we will give you a side-by-side comparison.